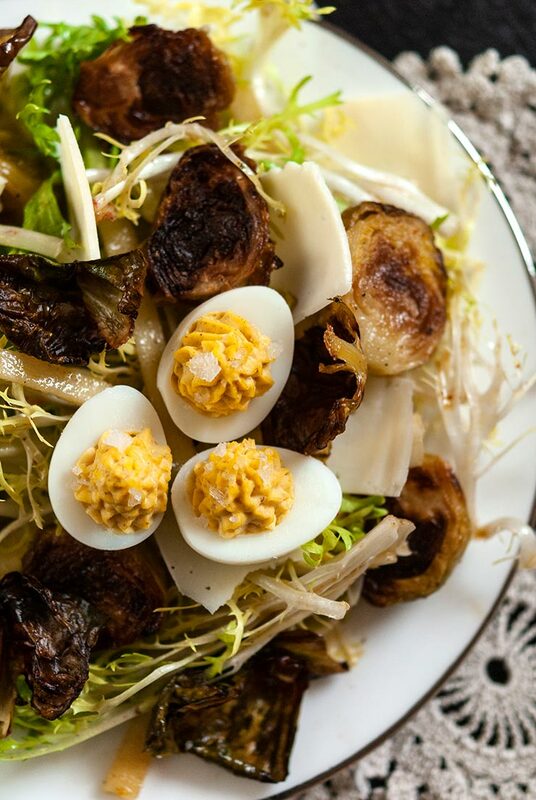 This earthy, roasted Brussels sprouts salad includes diced green apple, frisée, shaved almonds, shaved parmesan, a dreamy sesame & apple cider vinaigrette and deviled quail eggs that are so precious, your dinner guests will swoon at the sight of them! It’s crispy, it’s tender, it’s full of texture and rich flavors! It’s a statement salad that’s as exciting as the main course. I had one, last, rich dinner party before the weather gets too Springy for bold, cozy flavors! This salad was a perfect starter for my ultra rich, (very) late Winter Beef Bourguignon dinner party. I kept the appetizers light and the portions small, so even though the dinner was big on flavor, no one got too full to enjoy dessert. Roast them as the recipe calls for, but then, just before you serve the salad, bake them 1 more time at 400 for just 5 minutes. They’ll be crispy and delicious when fresh out of the oven, but after about an hour (while the roasted sprouts cool) they’ll loose their crisp a bit. A short zap in the oven will crisp them right back up again. 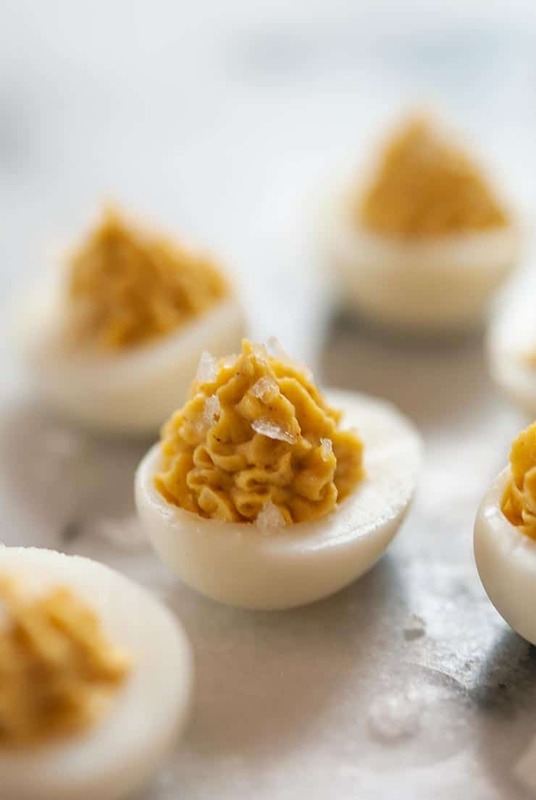 First, take a look at the full recipe for deviled quail eggs, but make sure to also hard-boil 2 regular-sized eggs and add their yokes to the quail filling mixture too. The quail yokes are so tiny that when you put your filling into a pastry piping bag, just the amount left in the pastry tip could make it hard to fill all your eggs nicely. 2 extra big yokes do the trick (and let you fill your quail eggs nice and high). 3. Serve as a small portion salad. This is a pretty rich salad, so if you have a flavorful or filling main course ahead of it, you’ll want to keep it on the small side so your guests don’t feel too full after the very first course. 1. 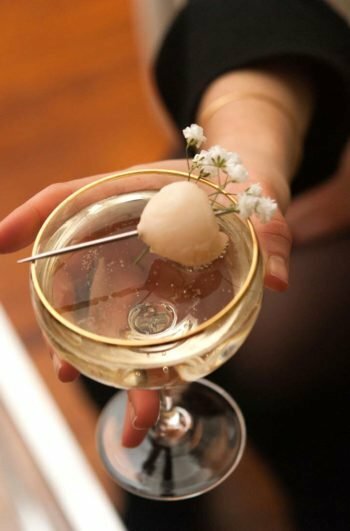 How do I make those precious deviled quail eggs? Simply put them in a pot of cold water, bring the pot to a boil (about 5 minutes), then remove from heat and let them sit in the cooling water for 12 minutes. Remove them and place them in a bowl of cold water for 5 minutes, and carefully peel them. That’s how to make sure they’re perfectly cooked, but check my full deviled quail eggs recipe for all the details! 2. How long before serving the salad should I roast the sprouts? The sprouts take 15 minutes to prep, 30 minutes to roast and 1 hour to cool, so make sure to give yourself about 2 hours to make’em and cool’em. 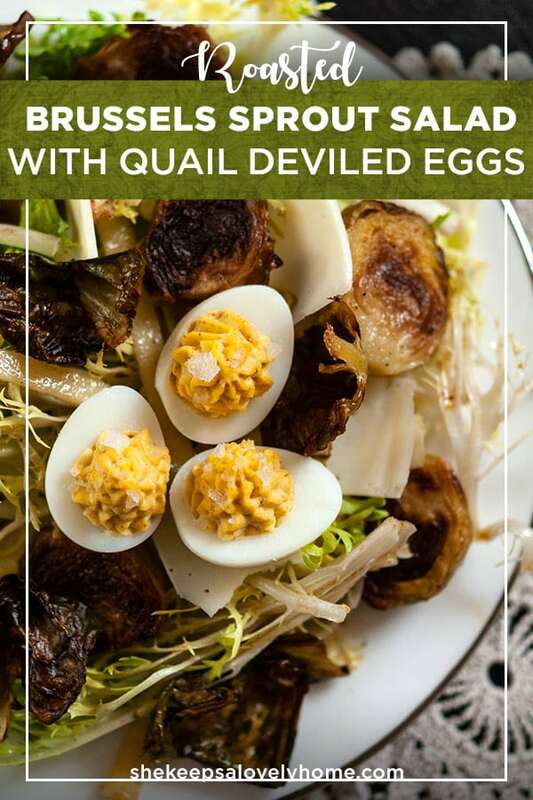 As noted above, when it comes to the deviled quail eggs, you’ll likely want to make them ahead and fill them just before you serve your salads, so a good time to get them boiling would be while you’re roasting your sprouts or while they’re cooling. And as noted in the full recipe, you can also make them a whole day ahead of time, and fill them just as you’re about to serve them. 1. 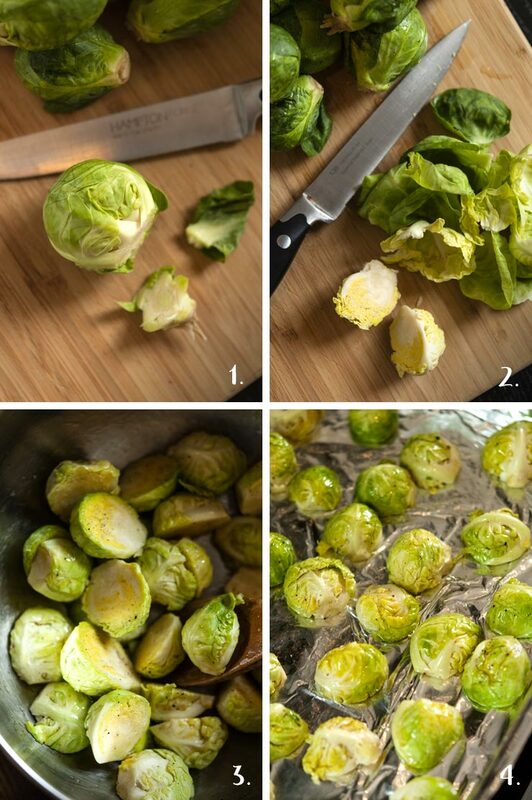 Pre-heat your oven to 400 F. (204 C.) Start by slicing the ends off of each Brussels sprout with a paring knife. 2. Remove a few of the outer leaves of each sprout, setting the leaves aside (don’t discard them). Cut each sprout in half. 3. In a large mixing bowl, toss just the sprouts with a tbsp. of olive oil and a nice sprinkle of salt and pepper. 4. Line a baking sheet with tin foil and place each sprout face down. 5. Place the leaves in the large mixing bowl and toss them with another tbsp. of olive oil, salt and pepper. 6. Sprinkle the leaves on top of the sprouts in the pan, doing your best to put them between the sprouts as much as you’re able. Place sprouts in the oven for 30 minutes. 7. Remove pan from the oven and separate the leaves from the sprouts into a bowl and cover with cellophane or place them in a container with a lid. Don’t refrigerate the leaves. Place the sprouts in a container or bowl and refrigerate until cool (about 1-2 hours). 8. Once your sprouts are cold, squeeze a half lemon into a bowl or on a plate. Slice your green apple into small sticks and quickly swish them around in the lemon juice to prevent them from browning. 9. Mix your delicious sesame & apple cider vinegar dressing. In a small bowl, combine 5 tbsp. sesame oil, 2 tsp. apple cider vinegar, 1 tsp. spicy mustard, 1 tsp. of Bragg’s Liquid Aminos (or soy sauce) and 1 tsp. honey. Give it a nice stir. 10. 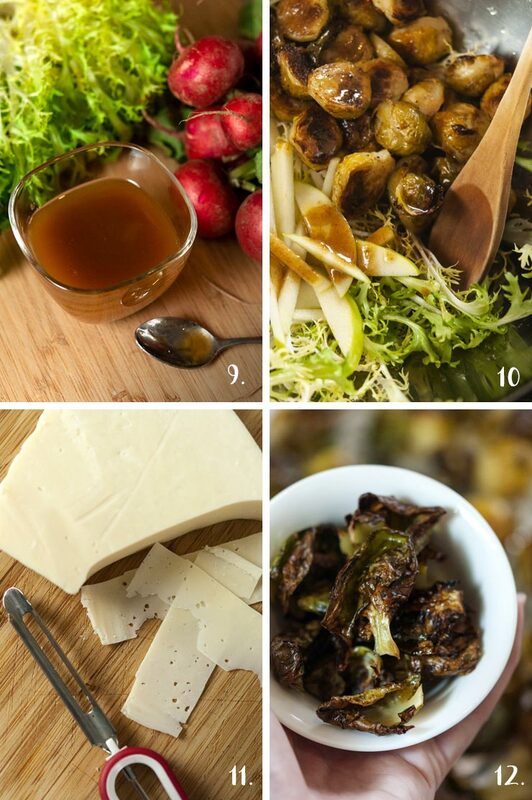 In your large mixing bowl, toss cold sprouts, chopped apple, frisée and shaved almonds with the dressing. 11. Shave fresh parmesan with an apple peeler and set aside. 12. Just before you serve your salads, bake the Brussels sprouts leaves at 400 for 5 minutes to make them extra crispy again if they’ve lost a bit of their crisp in their container. 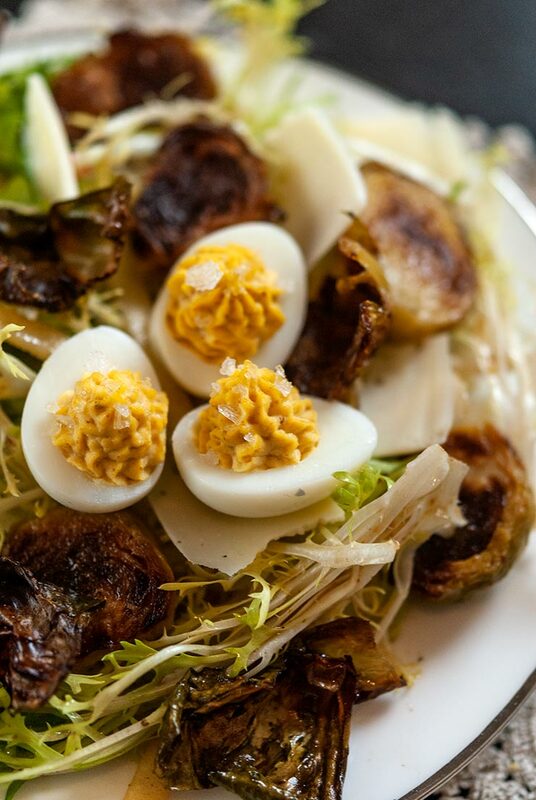 Assemble your salads, topping them with shaved parmesan, crispy Brussels leaves, and if you’re garnishing with deviled quail eggs, carefully pop them right on top too! 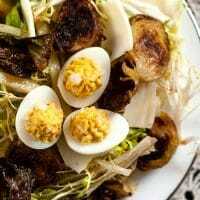 This earthy, roasted Brussels sprouts salad includes diced green apple, frisée, shaved almonds, shaved parmesan, a dreamy sesame vinaigrette and simple, deviled quail eggs so precious, your dinner guests will swoon at the sight of them! 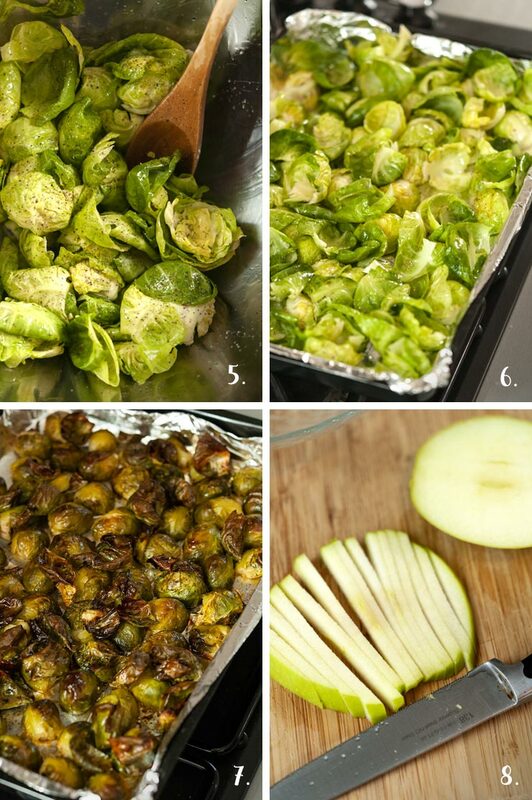 Pre-heat your oven to 400 F. (204 C.) Start by slicing the ends off of each Brussels sprout with a paring knife. Remove a few of the outer leaves of each sprout, setting the leaves aside (don’t discard them). Cut each sprout in half. In a large mixing bowl, toss just the sprouts with a tbsp. of olive oil and a nice sprinkle of salt and pepper and line a baking sheet with tin foil. Place each sprout face down. Place the leaves in the large mixing bowl and toss them with another tbsp. of olive oil, salt and pepper. Sprinkle the leaves on top of the sprouts in the pan, doing your best to put them between the sprouts as much as you’re able. Place sprouts in the oven for 30 minutes. Remove pan from the oven and separate the leaves from the sprouts into a bowl and cover with cellophane or place them in a container with a lid. Don’t refrigerate the leaves. Place the sprouts in a container or bowl and refrigerate until cool (about 1-2 hours). Once your sprouts are cold, squeeze a half a lemon into a bowl or on a plate. Slice your green apple into small sticks and quickly swish them around in the lemon juice to prevent them from browning. Mix sesame & apple cider vinegar dressing. In a small bowl, combine 5 tbsp. sesame oil, 2 tsp. apple cider vinegar, 1 tsp. spicy mustard, 1 tsp. of Bragg’s Liquid Aminos (or soy sauce) and 1 tsp. honey. Give it a nice stir. 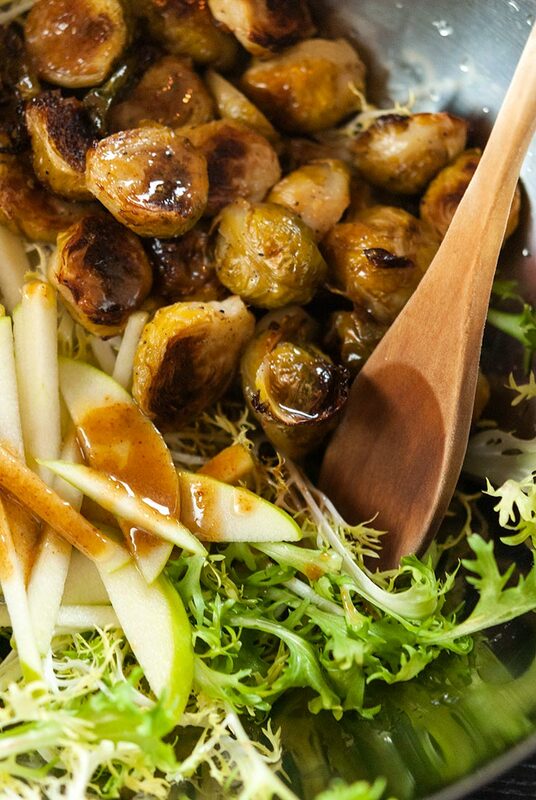 In your large mixing bowl, toss cold sprouts, chopped apple, frisée and shaved almonds with the dressing. Shave fresh parmesan with an apple peeler and set aside. Just before you serve your salads, bake the Brussels sprouts leaves at 400 for 5 minutes to make them extra crispy again if they’ve lost a bit of their crisp in their container. 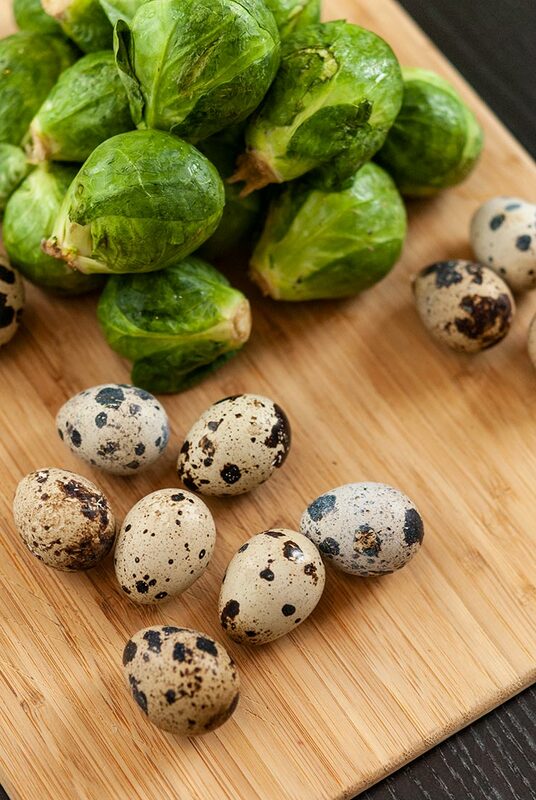 When it comes to the deviled quail eggs, you’ll likely want to make them ahead and fill them just before you serve your salads, so a good time to get them boiling would be while you’re roasting your sprouts or while they’re cooling. And as noted in the full recipe, you can also make them a whole day ahead of time, and fill them just as you’re about to serve them.